And we’re right back down to mediocrity. 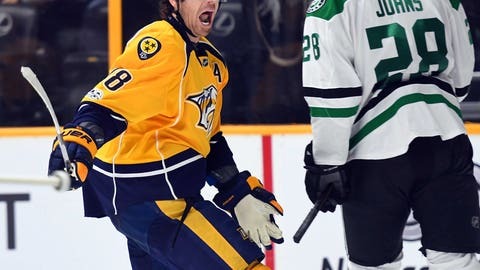 The Dallas Stars suffered a monumental collapse today after surrendering four goals in the third period in a 5-3 loss to the Nashville Predators. The Dallas Stars got out to a three-goal lead, but surrendered it and fell to the Nashville Predators 5-3. Today’s loss was especially disheartening because the Stars came into the game knowing it was a must win for their playoff hopes. The first period was fraught with penalties. Dallas has two separate 5-on-3 power play opportunities and the two teams dropped the gloves three times in the opening 15 minutes alone. The Stars won the special teams battle in the opening frame with power play goals by Jamie Benn and Patrick Sharp. They took their 2-0 lead into the first intermission. The intensity of the game remained rather high in the second period. Devin Shore scored on the power play for the Stars to put them up 3-0 with their third man advantage tally of the night. Nashville scored one to cut Dallas’ lead to two and the Stars took a 3-1 advantage into the second intermission. Nashville scored to make it 3-2 Stars on Roman Josi‘s power play goal. Then they tied the game and eventually took the 4-3 advantage with just under 14 minutes remaining in regulation. They then added an empty net goal to take a 5-3 lead, which is how the game ended. Both the Stars and the Predators knew what was on the line in today’s game from the get go. Although both clubs played yesterday, they came out with a lot of energy and were not afraid to get physical. With only six points separating the teams headed into the game, the two points for today’s winner had that much more value. Fights and penalties galore in the first period really set the tone for the game. Both sides were aggressive in their attacks, but Dallas’ ability to win the special teams battle in the opening period gave them a distinct advantage. That advantage, however, was short-lived. While the Stars established a three-goal lead in the second period with Shore’s beautiful back door goal, they lost momentum. Nashville came back and tied the game up, then took the lead with a shorthanded breakaway. Dallas did what Dallas does best. They established a multiple goal lead and surrendered it because they let up. They gave away odd man rushes toward Kari Lehtonen and it put them in a very vulnerable position. This is one of the biggest issues the Stars have. They so often get ahead in games and then somehow let the other team climb back into it. Dallas’ inability to close out games and really focus on maintaining their advantage is arguably one of their greatest obstacles. Unfortunately for Dallas, they manage to do it to themselves. Whether it is a mental issue or a systematic flaw, they simply cannot keep this trend up. It also is not specific to this season, though. The Stars have been playing this kind of “letting up” hockey for far too long already. Something needs to be altered so they stop shooting themselves in the foot. Dallas is in a very tough spot. While they have not yet been mathematically eliminated from the playoffs, their chances are slim to none. Jim Nill has a lot of tough decisions to make and the Stars need to take a long, hard look at themselves in the mirror to determine next steps. This roster playing this poorly is unacceptable and it goes without saying that something needs to change. The real question is what that change will be, when it will happen and who it will involve. The Stars will head to Winnipeg to take on the Jets Tuesday night after having a day to let this rather devastating loss sink in.